The Art Directors Guild (ADG) hosted their 14th Annual Excellence in Production Design Awards at the Beverly Hilton on Saturday, February 13. The winners in the Feature Film categories - period, fantasy and contemporary - were Sherlock Holmes, Avatar and The Hurt Locker respectively. Avatar and The Hurt Locker continue their neck-and-neck battle for glory in the Awards season culminating with the Academy Awards. Sherlock Holmes was perhaps a surprise winner since it was up against Best Picture nominees Inglourious Basterds and A Serious Man as well as Julie & Julia and Public Enemies. 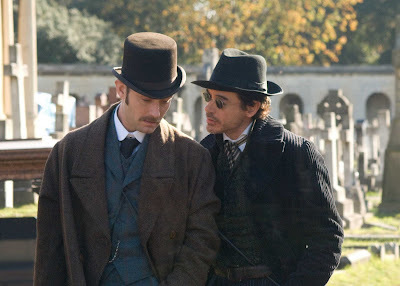 Sherlock Holmes is not nominated for an Art Direction Oscar. The other nominees are The Imaginarium of Doctor Parnassus, Nine and The Young Victoria. Production design is the creative department that deals with how everything in front of the camera will look. While the Director of Photography is in charge of the camera and lighting departments, the production designer/art director chooses styles, colours, patterns and looks for everything, and is in charge of the costume, hair, makeup, set decoration and other such departments. The terms production designer and art director are used synonymously, but if both are used, the production designer is higher ranking and the head of the art department. Absolut Anthem: "In An Absolut World"